We have ice time scheduled this Sunday November 19th with the Cougars at 4:45pm. We sent out a BenchApp earlier this week to gauge interest due to the fact that we also have the Grandforks Tournament this weekend. We had only one person confirm their attendance for Sunday. So with that said, we have communicated to the Cougars that we likely will not have a large amount of people show up because interest is low. If you are interested in attending on Sunday, please let Chelyse know via txt or phone call at 1-250- two31-2250 so she can plan accordingly. Hey, everyone! Just a few things... We have had some pretty low turn outs to some of our ice times and I just want to encourage everyone to try to make it out to at least one ice time a week. We cannot continue to book the Wednesday ice if there are only a handful of people coming out to it. Just to be clear you are welcome to play on both Wed and Thur as long as there is room which can be checked on BenchApp. This only works if you actually come out if you've signed up, so please make sure that if you have signed up that you show up. I know life happens but if it turns out that you can't make it, please change your status. We were also throwing around the idea of having a beer cooler at least at our Saturday ice time. We will be selling punch cards or taking cash, there will no longer be any IOUs. Let me know if you are interested in taking this on! I think that it is for now! Lace up those skates and get out there!! Hey! Hope everyone is having a great time so far this season! I have yet to make it out but hoping my schedule opens up in a couple weeks to allow me to come out! I was contacted by Mark, the coordinator of the outdoor Apex tournament we attended last January. I am away this year during that time, so I can't plan the getaway but if we are interested in sending a team, he needs to know by next Friday if we want our spot or not. There are lots of teams on the waiting list so not sure we want to loose out on keeping our spot. Please get the discussion going and I can forward his contact to whom ever wants to head that tournament. Saturday nights in Rossland usually at 7:30pm for 1 hr 15 minutes, not every Saturday due to tournaments. We have chosen to add every Wednesday this year for three months in hopes that we can self regulate ourselves as we may have up to 50 women this year on the roster. BenchApp is a great tool, let's aim for not more than 25 people on both Wednesday and Thursday and quick shifts. Check BenchApp or the google calendar on smokettes.com for up to date information and other additional ice times as everything is now up to date. Thank you to all that have paid, we will have sign-up sheets for those of you that have not filled out one and remember our rule of PAY before you play. We are looking to recruit more women to our squash program here in the area and are lucky enough to have a wonderful coach come to introduce new players to our sport on October 10th. This is a FREE event for new / returning / curious players and I would love it if you’d come give my (2nd) favourite sport a whirl! If you are interested, feel free to email me, but you will also need to register with Trail Parks & Rec at (250) 364-0888 so that we can collect numbers etc to prepare for the event. 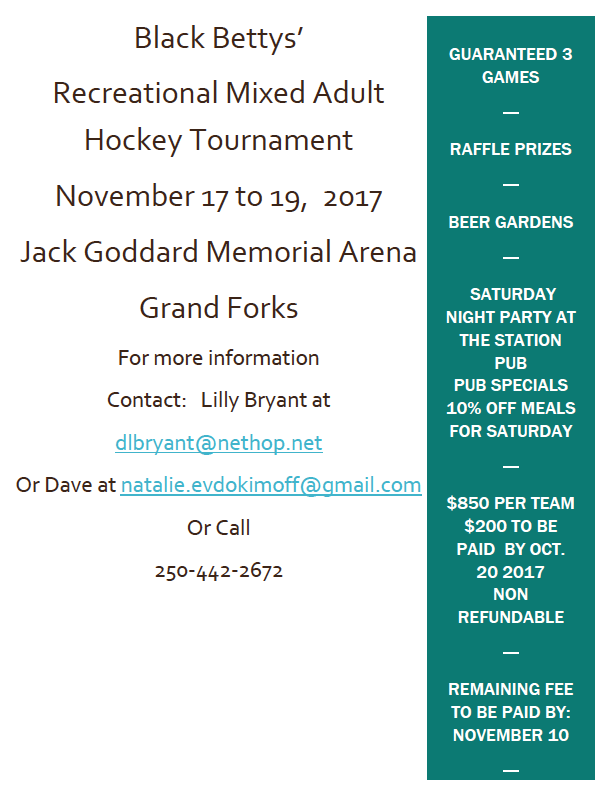 Black Betty's Tournament in Grand Forks - November 17th, 18th and 19th. Anyone interested in spear heading this tournament please e-mail me back. An initial BenchApp poll has been set for November 17th for general interest, if we have enough interest then we will put in our deposit and let the planning begin. See attachment for more information. For the new comers, WELCOME, and we are working on getting everyone on BenchApp, info to arrive in your inbox soon. Hockey season is just around the corner and it's time for the sign up party. By a single vote the party will be held on Friday, September 15th at 5:30. Please bring something for the potluck (I will have burgers so it would be greatly appreciated if someone can claim buns or toppings), a chair, a cheque/cash/direct deposit for season fees, your TRP card/number if you have one, and most important whatever you'd like to drink. As long as the weather cooperates the party will be in my backyard at 3243 Lilac Crescent in Trail. Hope to see you there! If you're planning to bring something for burgers please let me know by email (mallory.wiens at gmail.com) or text (250- nine21-5567). 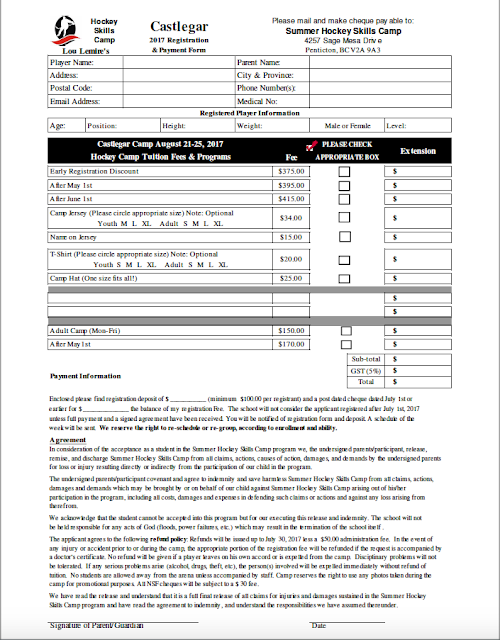 If you can not make the sign up night we have direct deposit, the fee this year is $225. E-mail trailsmokettes@gmail.com for more information. We are requesting that everyone pays before they play. If you can not direct deposit or come to the sign-up night please bring your money to the first ice time you come to. 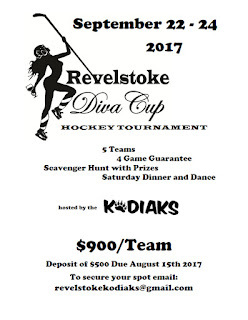 Bridget, Divana or Janice will be happy to collect the money and have you fill out the registration form. If you have financial hardship and a good reason why you will not be able to pay until a later date please e-mail us. I have 8 interested players already, and am looking for more to join the “hybrid” squad that is forming to go into the Castlegar Max Ice tourney (March 11 weekend)! Caitlin and Janis, you are already on my list. Mallory has graciously accepted to play net, as well! First come, first serve for this awesome local tourney! *Note: If there are a whole bunch interested, we could see about putting a second team in, depending on tournament room and/or how many players the other teams have. Thanks to Kathleen, here is this years team photo! 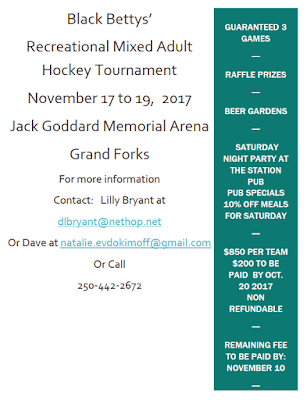 Also, if you have signed up on Bench App for the Grand Forks tournament but not paid Barb please contact her (barb_063@hotmail dot com) to make sure there is still a spot available as Bench App was only for an expression of interest. Hey, everyone! The tournament is fast approaching and we need to get you guys into teams so people can sign up for volunteer duties. Deadline for submitting requests is Monday, Feb 6 and after that date, all people who committed on bench app will be put randomly onto a team. Please let Barb know your preference ASAP (barb underscore 063 at hotmail dot com). Holly is starting a sign-up sheet for Saturday night dinner items for the tournament. We have pizza being brought in again this year, so items like salads, sides and desserts are best. People have brought vegetarian items in the past as well (chilli etc).